Context: In noise induced hearing loss (NIHL), cochlear hair cells are damaged by exposure to loud sound. The basilar membrane is tonotopically organized with the lowest frequencies preferentially transduced at the apex and the highest frequencies at the base. On the basilar membrane, the outer hair cells area corresponding to the 4 kHz and the adjacent areas of 3 and 6 kHz are most susceptible to damage. Aims: To screen the factory workers for early onset of NIHL. Subjects and Methods: Study was done over a period of 2 years that is, from September 01, 2011 to August 31, 2013 on 341 steel factory workers. Workers having a minimum of 5 years of noise exposure were included whereas workers having age >45 years or with conductive hearing loss that is, air-bone gap >10 dB were excluded from the study. Results: It was found that factory workers showed normal hearing, when calculated as average of 500 Hz, 1000 Hz, 2000 Hz, and 4000 Hz but they have started developing the early changes of NIHL in the form of notching at 4000 Hz frequency described as threshold shifts. It was seen that 198 right ears out of the total 341 studied showed threshold shifts >25 dB in 4 kHz frequency, even then 70 (35.35%) right ears showed hearing in normal range. In case of left ears 198 out of the total 341 studied showed threshold shifts >25 dB in 4 kHz frequency, even then 97 (48.99%) left ears showed hearing in normal range. People have always been surrounded by a variety of sounds in their environment, but the invention of gunpowder and the industrial revolution introduced new sounds of greater intensity than ever before. Loud sound, noise, is mainly the effect of industrial revolution throughout world and introduction of new machinery, hazardous noise in the workplace became an inevitable consequence. The introduction of steam power relating to the industrial revolution first brought attention to noise as an occupational hazard (National Institute for Occupational Safety and Health [NIOSH],1998). Hearing loss in craftsmen who fabricated steam boilers was referred to as "Boilermaker's disease. ", The making of boilers during the early days of the industrial revolution first produced this affliction among workmen in these factories, and by analogy it has been referred to as a form of industrially-induced hearing loss or occupational hearing loss. Hearing loss caused by exposure to occupational noise results in a devastating disability that is, virtually 100% preventable., Noise-induced hearing loss (NIHL) is the second most common form of the sensorineural hearing deficit, after presbycusis. In NIHL, cochlear hair cells are damaged by exposure to excessive sound. The degree and type of damage are related to the amount of noise exposure. The basilar membrane is tonotopically organized with the lowest frequencies preferentially transduced at the apex and the highest frequencies at the base. On the basilar membrane, the outer hair cells area corresponding to the 4 kHz and the adjacent areas of 3 and 6 kHz are most susceptible to damage., Audiometrically, Fowler  was the first to comment on the 4 kHz dip produced by noise. This study was done for the assessment of early onset of hearing loss in factory workers utilizing this concept. The study was done over a period of 2 years that is, from September 01, 2011 to August 31, 2013, on 341 steel factory workers. Workers having a minimum of 5 years of noise exposure were included in the workers having age more than 45 years or with a conductive hearing loss that is, air-bone gap > 10 dB were excluded from the study. Sound pressure level (SPL) was assessed using SPL meter model number dB 100 manufactured by KIMO instruments, of the particular area of the factory, to which the worker was exposed was calculated. SPL meter is manufactured according to the International Electrotechnical Commission 61672-1 class 2 standard specifications which was sound calibrated from time to time. It was found that even the workers showed normal hearing, when calculated as average of 500 Hz, 1000 Hz, 2000 Hz, and 4000 Hz but they have started developing the early changes of NIHL in the form of notching at 4000 Hz frequency [Figure 1] described as threshold shifts. It was seen that 198 right ears out of the total 341 studied showed threshold shifts >25 dB in 4 kHz frequency, even then 70 (35.35%) right ears showed hearing in normal range and 119 (60.10%) and 9 (4.55%) were found to be in mild and moderate range, respectively. Right ears which did not showed threshold shift at 4 kHz, 133 (93.01%) were having hearing in the normal range, and only 10 (6.99%) were having mild hearing loss [Table 1]. Threshold shifts at 4000 Hz frequency was compared with hearing impairment in workers left ears. It was seen that 198 left ears out of the total 341 studied showed threshold shifts >25 dB in 4 kHz frequency, even then 97 (48.99%) left ears showed hearing in normal range and 94 (47.47%) and 7 (3.54%) were found to be in mild and moderate range, respectively. Left ears which did not showed threshold shift at 4 kHz, 88 (61.54%) were having hearing in normal range and 51 (35.66%) and 4 (2.8%) were having hearing in mild and moderate category, respectively [Table 2]. As the middle ear's main function is to match the impedance of outer and inner ear. This system is a low-pass filter with a cut-off at around 1200 Hz, so it tends to attenuate high-frequencies above 4 kHz. This is also why the sound detection at higher frequencies tends to be much worse than at lower frequencies. l = length of tube (EAC). The length of EAC is approximately 25 mm long, so according to this equation the average resonance is around 3200 Hz. Thus, the resonant characteristics of the EAC help determine the acoustic energy delivered to the cochlea. For example, industrial noise typically has a broad spectrum; however, as it travels through the EAC, acoustic energy in the mid frequency range resonates or is amplified, creating a band-pass noise centered at 3200 Hz. Hence, it is typical to see a "4 kHz notch" in audiograms of patients with NIHL which is about half octave above the middle frequency of the noise. Henderson and Hamernick (1995) also cited studies that have found that the basilar membrane vibrations (a structure in the cochlea) show maximum displacement at half an octave over the stimulation frequency. The study found that the frequencies where NIHL occurs and depends on the anatomy of the patient's outer ear. Since not everyone's outer ear is 25 mm long, the NIHL may vary in which frequencies are affected. That is, why a little variation in the notch sometimes from 3 to 6 kHz is observed. It is important to know that early onset of NIHL may only affect very small bands of frequencies, so very large jumps in frequencies while testing may not be suitable in detecting the early onset subjects. Hence, when testing for the early onset, it is important to use narrow frequency changes in the high range and small dB changes. It was found that even if the workers showed normal hearing, when calculated as average of all the tested frequencies taken together but they have started developing the early changes of NIHL in the form of audiometric notching at 4000 Hz frequency. In our study, we have studied the 500 Hz, 1000 Hz, 2000 Hz and 4000 Hz frequency with small changes in the intensity of sound. In the present study, it was seen that 198 right ears out of the total 341 studied showed audiometric notching >25 dB in 4 kHz frequency, even then 70 (35.35%) right ears showed hearing in normal range and 119 (60.10%) and 9 (4.55%) were found to be in mild and moderate range, respectively. Right ears which did not showed audiometric notching at 4 kHz, 133 (93.01%) were having hearing in the normal range, and only 10 (6.99%) were having mild hearing loss. In case of 198 left ears out of the total 341 studied showed audiometric notching >25 dB in 4 kHz frequency, even then 97 (48.99%) left ears showed hearing in normal range and 94 (47.47%%) and 7 (3.54%) were found to be in mild and moderate range, respectively. Left ears which did not showed audiometric notching at 4 kHz, 88 (61.54%) were having hearing in normal range and 51 (35.66%) and 4 (2.8%) were having hearing in mild and moderate category, respectively. NIHL is characterized by the high-frequency hearing loss that may display a high-frequency notch in the audiogram.,, One reported a study conducted in Taiwan  investigated nearly 10,000 workers exposed to noise levels above 85 dBA from different sectors. They found that 34% of workers had hearing thresholds at 4000 Hz higher than 40 dB hearing level in either one or both ears. Barrs et al. found minimal NIHL notch at 3–6 kHz in approximately one-third (37%) of the workers in their study even though they had no symptoms. The results of Oleru et al. study, 1990, on hearing thresholds in an auto assembly plant in a Nigerian factory have shown that NIHL among workers usually occurs at higher frequencies. Similarly, NIHL at a frequency of 4000 Hz is more than that at 1000 and 2000 Hz. Hearing loss in workplaces starts at 4000 Hz and is then directed towards higher and lower frequencies. It was shown that in workplaces with high SPL, there was a meaningful relationship with increase in NIHL (odd's ratio = 4.25) and the rate of NIHL at frequency of 4000 Hz was more than other frequencies. 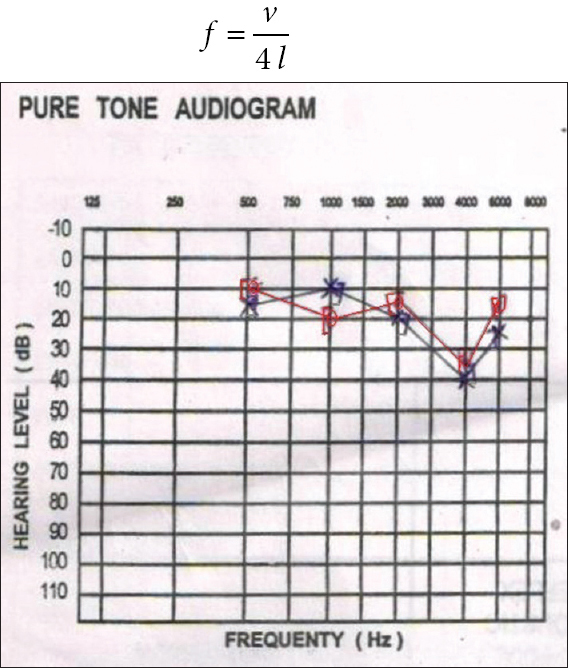 Our results were comparable to other reported studies, which also show the audiometric notching in pure tone audiometry finding but no hearing impairment when calculated by taking average of all the frequencies tested, as shown in [Table 3]. Regardless of the exact cellular mechanism, several phenomena related to loud noise do appear to be well-established. Damage within the cochlea tends to occur initially and to the greatest degree in the portion which detects sound in the 4000 Hz range. This progresses steadily over the initial decade of exposure and then tends to plateau. Typically, the next affected area is in the 6000 Hz region followed by the 8000 and the 2000 Hz regions where losses are more slowly progressive. It was found that even if the workers showed normal hearing, when calculated as average of all the tested frequencies taken together, but they have started developing the early changes of NIHL in the form of audiometric notching at 4000 Hz frequency. Hence, pure tone audiometry, a basic investigation in the armamentarium of an ENT surgeon can be utilized in a better way to screen the factory workers for occupational hearing loss. Hence, that they can be monitored for early onset of any NIHL and motivated and educated for the prevention of the same. Clark WW. Five Myths in Assessing the Effects of Noise on Hearing; August, 2000. Available from: http://www.audiologyonline.com/articles/five-myths-in-assessing-effects-1292. [Last accessed on 2013 Nov 11]. NIOSH. Criteria for a Recommended Standard-Occupational Exposure to Noise. Revised Criteria 1998. Department of Health and Human Service, Centre for Disease Control and Prevention, National Institute for Occupational Safety and Health. Cincinnati, Ohio: DHHS (NIOSH) Publication; 1998. Rabinowitz PM. Noise-induced hearing loss. Am Fam Physician 2000;61:2749-56, 2759-60. Gillespie I. Noise-induced hearing loss: A preventable condition. British Columbia Medical Journal 2011;53:115-6. Dobie RA. Medical-Legal Evaluation of Hearing Loss. 2nd ed. San Diego, CA: Singular, Thomson Learning; 2001. Alberti PW. The anatomy and physiology of the ear and hearing. In: Goelzer B, Hansen CH, Sehrndt GA, editors. Occupational Exposure to Noise: Evaluation, Prevention and Control. World Health Organization Special Report S64. Dortmund, Germany: Federal Institute for Occupational Safety and Health; 2001. p. 53-62. Available from: http://www.who.int/occupational_health/publications/noise.pdf. [Last accessed on 2013 Oct 10]. Kurmis AP, Apps SA. Occupationally-acquired noise-induced hearing loss: A senseless workplace hazard. Int J Occup Med Environ Health 2007;20:127-36. Fowler EP. Limited lesions of the basilar membrane. Arch Otolaryngol 1928;8:151. Henderson D, Hamernik RP. Biologic bases of noise-induced hearing loss. Occup Med 1995;10:513-34. Harding GW, Bohne BA. Distribution of focal lesions in the chinchilla organ of Corti following exposure to a 4-kHz or a 0.5-kHz octave band of noise. Hear Res 2007;225:50-9. Le Prell CG, Yamashita D, Minami SB, Yamasoba T, Miller JM. Mechanisms of noise-induced hearing loss indicate multiple methods of prevention. Hear Res 2007;226:22-43. Wilson RH. Some observations on the nature of the audiometric 4000 Hz notch: Data from 3430 veterans. J Am Acad Audiol 2011;22:23-33. Wu TN, Liou SH, Shen CY, Hsu CC, Chao SL, Wang JH, et al. Surveillance of noise-induced hearing loss in Taiwan, ROC: A report of the PRESS-NHL results. Prev Med 1998;27:65-9. Barrs DM, Althoff LK, Krueger WW, Olsson JE. Work-related, noise-induced hearing loss: Evaluation including evoked potential audiometry. Otolaryngol Head Neck Surg 1994;110:177-84. Barry SL, David HW. Noise and hearing impairment. Occup Health USA 2000;1:321-38. McBride DI, Williams S. Audiometric notch as a sign of noise induced hearing loss. Occup Environ Med 2001;58:46-51. Taylor W, Pearson J, Mair A, Burns W. Study of noise and hearing in jute weaving. J Acoust Soc Am 1965;38:113-20.